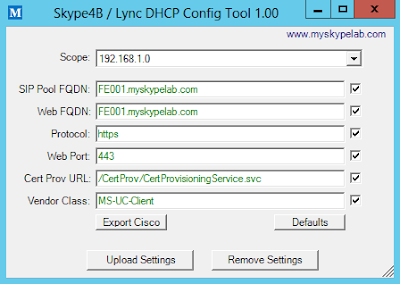 The Skype4B / Lync DHCP Config Tool is a replacement for the Skype for Business / Lync DHCPUtil tool. It makes uploading, editing and deleting Option 43 and 120 from Windows DHCP server easy. It also offers the ability to export settings for Cisco Switch/Router DHCP servers. This tool is a Powershell script that runs with a GUI front end for easy of configuration. Execute the script from the Powershell command line. [Skype for Business] Failed to execute a stored procedure on the back-end. Merci a Chris pour avoir pris du temps de détailler dans son blog la correction de ce problème! Microsoft travaille activement a offrir usagers ayant un poste de travail Mac la même expérience que l'on peut avoir aujourd'hui avec un environnement Windows. Avec les politiques BYOD, les Mac sont omniprésents dans les entreprises, le retour d'expérience avec le client actuel n'étant guère concluant, cette nouvelle est porteur de beaucoup d'espoir de pouvoir répondre à cette insatisfaction. Un Webinar hier a communiquer des informations sur ce nouveau client pour Mac. Microsoft a publié cette semaine le guide d'utilisation pour la version Skype for Business Android mobile. Use this document for step-by-step instructions for installing and using Skype for Business for Android. Skype for Business for Android is a productivity app that brings Skype Meetings, presence, instant messaging (IM), voice, and video capabilities to your Android mobile device. This document contains guidance and/or step-by-step installation instructions that can be reused, customized, or deleted entirely if they do not apply to your organization’s environment or installation scenarios. Add and remove a device number to or from a Shared Number workgroup. View all device numbers that are configured for a certain Shared Number. View a Shared Number that a device number is configured for. Set Maximum Number of Calls for every Shared Number workgroup. Busy on Busy – excess calls are automatically rejected with a busy signal. Call Forward Busy – excess calls are routed to an alternative number that's configured for the workgroup. Voicemail on Busy - excess calls are automatically forwarded to Voicemail. Share answering incoming calls for the workgroup's Shared Number. Set SLA Maximum Number of Calls, which indicates the maximum number of concurrent calls that they can use. View the call status of each other's shared lines. Put calls on hold (park calls), and retrieve them from another device within their SLA workgroup. Transfer calls to a number outside the SLA workgroup. Une nouvelle mise à jour Skype Entreprise mobile pour iPhone/iPad est disponible depuis aujourd'hui. Audiocodes a introduit une nouvelle passerelle analogique intéressante dans son catalogue, AudioCodes MediaPack(MP)-1288 peut supporter jusqu'a 288 port FXS, bien plus qu'un MP-124D ayant une capacité de 24. C'était attendu pour cette semaine, la mise à jour pour Skype Room Systems (SRS) est disponible pour Polycom, Crestron et SMART. Un client nous a rapporté avoir des problèmes lors de tentative d'utiliser la fonctionnalité de fusionner deux appels dans une conférence directement avec un téléphone SNOM. Une trace sur le téléphone SNOM ne montre pas d'éléments pouvant amener à une approche corrective. Le problème venait du certificats affecté au niveau du serveur FE (en version standard). L'ensemble des certificats sont signés par une autorité de certification publique. Lors de leur migration de Lync Serveur 2010 à 2013, le certificat existant fut conservé sans modification, le subject name étant le nom du serveur Lync Serveur 2010 et le nom du nouveau srv 2013 fut ajouté dans le SAN. Microsoft vient de publier des mises à jours de sécurités pour Lync 2013 (Skype for Business). Download the security update for Lync 2013 Service Pack 1 (32-bit) (Skype for Business) now. Download the security update for Lync 2013 Service Pack 1 (64-bit) (Skype for Business) now. L'annonce est maintenant officielle sur le blog Office, les systèmes LRS vont basculer aussi en version en expérience Skype for Business. En attente maintenant de la livraison de la mise à jour. Il est disponible! le Bandwidth Calculator pour Skype for Business vient d'être rendu disponible aujourd'hui. This new version for the Skype for Business Bandwidth Calculator brings a few new enhancements and is the first instance to leverage Skype for Business. Basically, it brings capabilities to estimate bandwidth for full on premises, hybrid or online only deployments. It also brings the new Skype for Business client and the SILK codec for peer to peer audio calls in the bandwidth estimations. Une fonctionnalité intéressante avec la version UCM 11 et enfin disponible est la possibilité de supprimer de manière autonome les firmwares non utilisés. The Device Load Management window allows you to delete unused firmware (device loads) and associated files from the system to increase disk space. For example, you can delete unused loads before an upgrade to prevent upgrade failures due to insufficient disk space. Some firmware files may have dependent files that are not listed in the Device Load Management window. When you delete a firmware, the dependent files are also deleted. However, the dependent files are not deleted if they are associated with additional firmware. ms-diagnostics: 4005;reason="Destination URI either not enabled for SIP or does not exist";source="Lyncpool.domainname.com"
Failed to synchronize remote domain contoso.com due to missing data privacy boundary for local or remote domain. Source of replication is: AddressBookReplication. This is usually caused when privacy boundary is not associated with local or remote site. Lync Server is deployed in Child domain or server / pool name naming convention has child and parent domain relationship. This issue occurs when the user replicator does not query all the available domains. This forces the user replicator to query all the available domains.